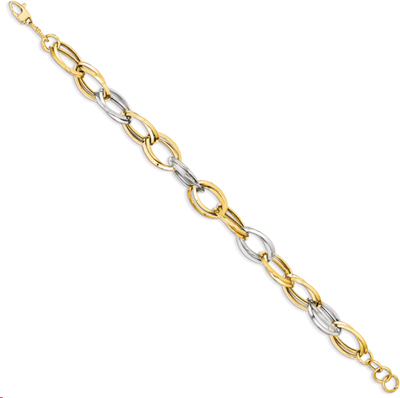 Fabulously unique, our 14k two-tone gold elliptical link bracelet is a preview of next year's fashionable designs. Measures approx. 1/2" wide (12mm). Measures 8" in size (the little bit of extra length is needed due to the way the links intertwine. Fits most standard sized wrists. Comes with secure, lobster claw clasp. We guarantee our Elliptical Link Bracelet, 14K Two-Tone Gold to be high quality, authentic jewelry, as described above.